Celebrating the Soldier and Not the Cause? Organizers of tomorrow’s “Heritage Rally” in Montgomery, Alabama are making every effort to accurately recreate Jefferson Davis’s swearing in ceremony. They have stipulated which flags can be carried as well as guidelines for proper period clothing. As in the case of the recent Secession Ball in Charleston, South Carolina, we are unlikely to hear anything about the importance of slavery and race, which will no doubt be made easier by the fact that Davis’s speech does not explicitly mention it. I do find it interesting that the February 1861 event did not include Confederate soldiers nor did it include the flags that will likely be visible from every point along the parade route. What I find interesting is the close identification that is implied between the presence of Confederate reenactors from various units and, arguably, one of the most important political events of the period. After all, it’s the Sons of Confederate Veterans, who constantly remind us that the common soldier ought not to be understood in political terms. In other words, they fought for hearth and home, but they certainly did not fight to maintain slavery. What tomorrow’s march up Dexter Ave. represents – even if it is unintentional – is the fact that the Confederate army operated as the military arm of the Confederate government. The army itself was an integral part of a political entity. By default the soldiers in the ranks fought to protect and preserve a constitution that was crystal clear about the importance of slavery and white supremacy as a defining principle of the new nation. This close connection between the soldier and state will be reinforced tomorrow by the thunderous roar of hundreds of enthusiastic Confederate reenactors. We should be thankful that the cause for which they will cheer tomorrow was ultimately unsuccessful. Yes, it will be a very bad thing if the Confederate Battle Flag is a part of the re-enactment of the swearing in of Jefferson Davis, as would be Confederate Soldiers as a part of the ceremony. That sort of anachronism greatly detracts from any re-enactment. I suspect, however, that any march will include the audience, and not be limited to just the re-enactors. At most re-enactments I have been in, there are bleachers and people sitting on them in 21st century costumes. Those folks wearing 21st century clothing actually are encouraged to talk to the re-enactors and walk around the army camps. It is as bad as those poor Union and Confederate soldiers who had to fight their battles with all those monuments in their way. You are free to comment on the subject of individual posts, but please don’t use it to sell your book. I wonder if there will be a public protest? It would be cool if those guys who dressed up as Klingons and crashed a Civil War reenactment a few years ago showed up for this. I for one, will be commemorating and celebrating in my own way this weekend. 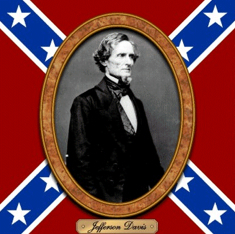 From the perspective of 150 years later, the inaugural of Jeff Davis as president of the Confederacy was one step closer to emancipation in the struggle of freedom for all Americans. I will raise a glass of ice tea to salute your celebration. We still have a long way to go before all Americans are free, but we have made some progress. I agree that “the Confederate army operated as the military arm of the Confederate government.” And I would add that the Confederate government acted in the interests of the slave holding elite. The SCV is dug in around the notion that the common Confederate soldier did not own slaves and therefore was somehow removed from the conflict to preserve the institution. At the time that young men were being recruited into the Confederate Army, were they being told that they were defending hearth and home or that they would be fighting to preserve slavery and white supremacy? I wonder how many of the reenactors will be dressed up as slaves. A friend of mine is a noted physician. She often re-enacts as a slave. She is certainly not the only one. Kevin posted a video of a number of people re-enacting as slaves recently. I have lost touch with a fellow who had done several walks to freedom to trace the route of the underground railroad. Last I heard he was setting up a slave plantation where people could go to learn about the experience of the slaves. He was also a member of the Sons of Confederate veterans. enactments generate emphasizes these facts and serve a useful purpose by doing so. and devolve power to the states to address or not address them as their people wish. Long live individual freedom and the United States of America. I served in the US Army for twenty years and was under no illusion that although I had joined to serve and defend my country, my government chose the time, place, and the reasons I would be employed to do such. I was an insturment of my government and its policies, of its overall objectives when it deployed me and my fellow soldiers to a region of the world. I did not always agree with all those reasons, but I had the option of leaving the service if it the reason caused a significant disagreement with those policies and causes. In other words, I was not an unthinking robot and most of the time I understood and agreed with my government when I was sent to enforce its views or uphold its cause in the wider world. Soldiers enlist for many reasons, but they do not decide what fights they will engage it or have an opportunity to debate the causes of that fight. But they almost always enlist because they agree with the reasons their government tells them they are needed. Confederate soldiers were not fools nor were they unaware of the issues of the day and what had brought about the crisis they and their region faced. I have four direct Confederate ancestors who fought in the army during the Civil War, one who was with Lee and the ANV at Gettysburg, where he was captured. I can admire his courage, his devotion to his fellow soldiers, and thank God he was defeated, along with the rest of the Confederacy. For as noble and as brave as I think he was, I still agree with General Grant that never had braver men fought for a worse cause. There is simply no way to separate the Confederate soldier from his government’s stated purpose, that of the protection and spreading of slavery. In the end, he had no choice in the matter, and in the beginning, he had to know the issue of the day. To say that he didn’t is to consign him to the mindless robot status, the unthinking tool of the planter class and wealthy slaveholders who controled his government. I am unwilling to do such. Thanks so much for leaving such a thoughtful comment. You’ve made my point much more eloquently and with the personal history that I can never truly understand. Fortunately, we have a large body of scholarship that demonstrates that Civil War soldiers were not unthinking machines, who were simply manipulated by their respective governments. They thought hard about what the war was about and we have their letters and diaries to prove it. I suspect that you have read “Company Aytch: Or, a side show to the big show.” Sam Watkins was certainly no historian, and he wrote long after the events, getting some dates and details wrong. But he does tell about more than one Unionist in his regiment. I especially like his telling of how the Unionist beat the fire-eating Secessionist in the election for Corporal. There were quite a few Confederate soldiers who later joined Union regiments. Yes, I am quite familiar with that book. I also thank you for your comment. I agree with both you and Ulysses Grant about the “worse cause”, and I share your gratitude that the Confederacy was defeated. You are correct in saying that soldiers should not be thought of as mindless robots. I strongly agree that a person’s options are to do as told, or leave the organization. I do think, however, that some of this might be misapplied. My service in the US Army was less than yours. My observation, however, is that the overwhelming factor in determining which army a person joined during the War Between the States was where they lived. It was not their agreement with the government currently in power where they lived. There are many exceptions, but they are a small fraction of the total. The one place where this was definitely not the case was in Missouri during the Ozark Civil War, and to a lesser extent in Kentucky and Tennessee. As you say, there are many reasons why a soldier enlists, but none is as strong as where their home is and their families live. There were quite a few Unionist among the Confederate Dead at Gettysburg. Thank you for your thoughtful reply above. Again, I agree and have always held the view that people enlist in the army, then as now, for many reasons, even where they live might be a good reason for enlisting. How many New Yorkers joined the US Army after 9/11? I can understand some of the reasoning of certain Southerners joining the Confederate army for fear of danger to their homes and families. But what must be understood between the reason for an individual enlisting and his government’s stated objectives do not always meet. No one asks the soldier to vote if he is going to march that day and no one asks the sailor to vote on if his ship will visit a liberty port or stay at sea for six more months of combat deployment. I also have no problem with someone who wishes to honor their ancestor’s service and bravery in the Civil War. But it must be recognized that those individuals made up an army and that army was a part of the Confederate government and that government told it where to go, how long to stay there, who to fight, and more importantly, why it was fighting. I had a friend who was a member of an Sons of Confederate Veterans and he always wanted to remember the courage and bravery of those Confederate soldiers who fought during that war. I have no problem with that, but we always debated on a forum as to how involved these soldiers were in the causes of the war, in particular, the cause of slavery as the primary cause of that war. He always wanted to distance the ordinary soldier from that issue, stating time and again the ordinary soldier was more concerned with hearth and home vice political issues of the day. I would counter that it simply did not matter if the Confederate soldier was a slaveholder or not, or if he had enlisted for any other reason than the preservation of slavery or not. The institution was forever connected to the Confederate soldier for wherever he marched and fought, whether he intended to or not, he fought for its continued existence and the hope of spreading it to other parts of the country. He could not help himself in doing so. Thank you for taking the time to ‘talk’ with me.